Now celebrating its 125th anniversary, the New Mexico Military Institute stands as a Roswell enigma: a time-honed trainer of America’s best and a bit of a local mystery. Above: A formal courtyard ceremony marks completion of the 21-day Recruits at Training program. Here students are recognized for their work and receive their first privileges. NO SOONER DO I ARRIVE on the campus of New Mexico Military Institute in Roswell than I’m in the way. Lieutenant Colonel Colleen Cole-Velasquez, director of communications, ushers me quickly onto the sidewalk as hundreds of cadets march past in an impressive show of pageantry and discipline. She uses her phone to broadcast live video. “Parents love to see their kids,” she tells me. It’s like a shining river, this procession, impressive to the eye and stirring to the spirit, cadets in light blue Class C uniforms marching in step, syncopated to the regimented beat of the drummers at the back of the line. “Eyes … right!” each troop commander calls as the cadets in his or her troop pass the members of the regimental staff, high-ranking cadets who lead the corps. Everywhere else in Roswell, people are going to lunch by, well, by going to lunch. 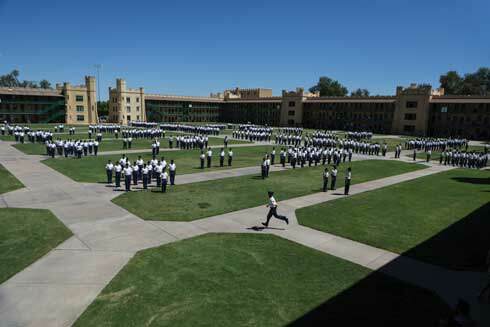 But cadets at New Mexico Military Institute, or NMMI, are making their way to the dining hall with purposeful intent. Cadets at NMMI, I learn, do everything purposefully. That’s been true since the institution was founded as the Goss Military Academy in 1891—NMMI began the year of its 125th anniversary with homecoming this October. Over those many decades, NMMI has become an integral part of the city of Roswell and the state of New Mexico. It counts among its alumni individuals like World War II Air Force pilot and Medal of Honor recipient John “Red” Morgan, artist Peter Hurd, and hotelier Conrad Hilton. Yet it remains a mystery to many, even to some in Roswell. It fights misconceptions: that it’s a reform school, or a resort for rich kids, or that it’s exclusively for students who want to enter the military (though many cadets here do pursue academy nominations and a military career). NMMI is, simply put, an internationally regarded boarding school that uses military protocol to nurture around 1,000 students a year, ranging in age from 14 to 22, high school through junior college. In the warm afternoon sun after lunch, Cole-Velasquez shows me around the campus, or post, as it’s officially called. The yellow brick buildings, built in military Gothic style, resemble small castles. Pigeons strut across their turrets like sentinels on duty. Trees are numerous, and there’s plenty of green space, which the squirrels enjoy without fear: Cadets are not allowed to walk on the grass. We visit the library, the post office, and the museum. (On display is a football signed by former Naval Academy and Dallas Cowboys quarterback Roger Staubach, another NMMI alum.) There’s a police department and an infirmary. We also visit the two-chair barbershop. On their very first day at NMMI, when new cadets are getting their first military-regulation haircut, parents will watch through the window and take photos. As the lieutenant colonel and I cross the main square, Bronco Plaza, she cautions me not to step on a long black mat stretching some 20 feet across the plaza. Cadets assigned to Flame Duty will march the length of that mat when protecting the Centennial Flame, lit on special occasions. I’ll get to see that flame myself, turns out. It will be lit over the weekend for the Family Week-end and Open House. Maybe it’s the stark lines of the architecture, echoed in the creases of the uniforms the cadets wear. Maybe it’s the enunciated announcements over the loudspeaker, or the snap of the flags in the wind. But everything around me—even the air itself, somehow—feels crisp and orderly. As the day progresses, I become increasingly self-conscious about the dust on my shoes, the uneven part in my hair, and the small spot of spaghetti sauce I spilled on my shirt at lunch. I resolve to do better the next day. I AM ON POST BEFORE SUNRISE the next morning because I want to see how NMMI wakes up. 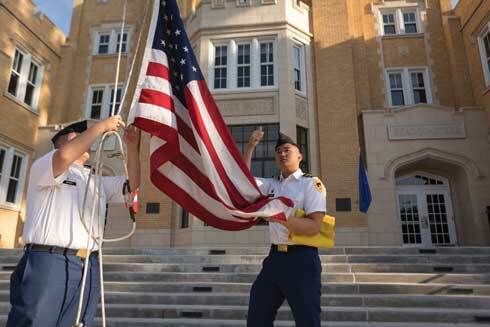 Reveille blows at 6:00 every morning, and simultaneously, cadets raise two flags on post, at Lusk Hall and Luna Hall. In Hagerman Barracks, cadets file out of their rooms and into the courtyard, a grassy enclosure known as the “box.” Polished shoes clack as they descend metal stairs; leather straps snap against the sides of rifles; sabers ting as they rock in metal belt rings. With visual details lost to the gray dawn, the scene takes on an almost mythical quality: soft outlines of figures huddled together, like a gathering of medieval knights on a misty moor some morning long ago. Cadets assemble with their troop. The troop structure is a core part of NMMI. Every cadet is assigned to a troop and will remain with it throughout his or her time here. Troops, comprising 70 to 80 cadets, are intentionally mixed, with both high school and junior college students. Cadets come from all across New Mexico and the rest of the United States and, at present, 13 countries. And they’re co-ed—females make up about 20 percent of the NMMI corps and hold almost half the leadership positions. (Their rooms, however, are accessible only to other females; males’ rooms, similarly, are off-limits to female cadets.) Troops room together, eat together, drill together, and often, as I learn during my visit, form deep friendships together. The sound of drums arises in the distance as the NMMI band, Troop HQ, marches onto the parade ground north of the barracks. The other troops follow. This morning, cadets are holding a practice parade to prepare for the formal parade that will open Family Weekend. Troop and squad commanders watch closely and correct errors, no matter how minor: a troop flag held slightly too high, a cadet slightly out of step. But as the band plays the service song for each branch of the armed services and cadets file past for the final review, all I see is precision and order. During my visit, I got to know three of those cadets individually. CADET SERGEANT MAJOR JOSE SALIDO, 19, from Hermosillo, Mexico, is one of many cadets who have come to NMMI from the Mexican state of Sonora. (A former governor of Sonora, in fact, is an alum.) When Jose first arrived on post, what English he knew he’d learned from listening to American oldies music—but he found that the words sounded very different when they were yelled rather than sung. “I didn’t know where I was,” he recalls of his bewildered first year. But he learned both the language and the protocols and became one of three squadron sergeants major, overseeing five troops and 300 cadets. As he leads me across post one day on a tour, I notice that other cadets, seeing the “round brown” hat that gives away Jose’s position, straighten up when they see him. He calls out to one RAT who isn’t running within the box (required of RATs), though when we get closer, Jose gives him a nod of encouragement. Jose wears a saber as part of his uniform. But for special occasions, he wears a different one: the one given to him by his father, who attained the same rank in his own youth at the Army and Navy Academy, near San Diego. Cadet Major Megan L. Byers, 20, is a member of the Mescalero Apache tribe, near Ruidoso in southern New Mexico. She didn’t plan to come to NMMI—it was her brother’s interest that compelled the family to first visit the campus. He didn’t apply, but Megan did. Only 14 years old at the time, she found it hard at first to be away from home, she tells me. But now, six years later, life at NMMI has helped her develop strong interpersonal bonds with her fellow cadets. “All of us pull different characteristics from one another,” she says. “You build a family here.” Megan feels that NMMI offers her an opportunity to carry on the spirit of her tribe and to give something back as well—she plans, after getting her master’s degree in criminal justice, to work as a police officer for the Bureau of Indian Affairs. Relying in part on the confidence she developed at NMMI, Megan ran for Miss Indian World this year. During the cultural presentation of the competition, at the Gathering of Nations in Albuquerque in April, she masterfully demonstrated a traditional Apache War Dance to an audience of several hundred attendees. Above: Thumbs-up is signaled to the bugle player after the "retreat" is played at sunset. AS I WATCH THE CADETS on the parade ground, I can’t help but wonder: How does it happen? How do cadets like Jose and Megan and Luke transition from bewildered RATs to the poised and confident cadets marching before me? I find at least a partial answer in an unlikely spot: a narrow platform 60 feet off the ground. As cadets one after another descend the rappelling tower like it’s a walk in the park, I ask Major Eric Evertson what it means for students to confront this challenge. Rather than answer himself, he defers to the cadets as they offer their own personal stories. They tell me of learning from mistakes, being mentored by their troop leaders, overcoming small but significant personal challenges—like learning to tie a square knot. But there’s something else, I sense, and I suspect it’s atop that platform. So Major Evertson and I climb three levels of stairs and emerge where the birds fly by at eye level. Way up high, big things stand out: the Capitán Mountains to the west, the Pecos River to the east, and the green dome of the Chaves County Courthouse downtown glistening in the afternoon sun. I’m not going to rappel—I’m not trained, and also, like, no way. But I do want to understand this challenge from the cadet’s point of view. Major Evertson has fitted me with rappelling gear and wrung the guide rope around the bracing bar on the platform. With gentle but insistent direction, he encourages me to the edge of the platform, where I place my heels just over the boundary and lean backwards into the abyss. Whereupon the entirety of my mental faculties become devoted to cataloging all that could conceivably go wrong. A partial list: The rope could break, the tower could tip over, my harness could slip, a bird could attack. I realize that there’s only one way that I, or anyone else, can summon the willpower to go backwards down a wall. I have to trust. Stepping over that edge—learning, growing, becoming a cadet—comes not just as an act of personal bravery, but also as an expresion of faith in your fellow cadets. As I step back up onto the platform, I feel I am beginning to understand the power of this institution. But it’s Major Evertson who puts it into words for me. “This place changes people,” he says. MUCH OF THAT CHANGE, I find, originates in the classroom. “This is HD education,” Brigadier General Douglas Murray, the academic dean, tells me when we visit in his office. “We offer the fundamentals,” he explains, just as a television set does, “but enhanced,” like a high-definition, state-of-the-art model. Academic standards are high, but the support network is strong. Every cadet has a one-on-one academic adviser, a leadership adviser, and access to three chaplain counselors, as well as group and peer tutoring. Cadets routinely score higher on ACT scores than the national average, and NMMI was ranked second in the country for transferability to a four-year university. But perhaps the greatest enhancement, Murray tells me, is the fact that student placement is determined by ability, not age. It’s not uncommon for a classroom to include both high school and junior college students. The same is true with rank, awarded by the demonstration of leadership ability: It’s possible for a cadet in high school to have a higher rank than one in junior college. “Our curriculum is founded on liberal education,” Murray says, “and developing the whole person: mind, body, and character.” I get to see that HD education up close when, to my delight, I’m invited to Captain Lindsay Mayo Fincher’s high school English class, where students are performing a scene from A Midsummer Night’s Dream. It’s the play within a play of Pyramus and Thisbe. One cadet wears a hat decked out with yellow fur and eyes to perform the part of the lion. “I hope I don’t have to wear this to formation,” he jokes. The class discussion that follows, focusing on Shakespeare’s use of malapropism and inversions, moves quickly. Very quickly. Retreating to old habits, I pretend to be engrossed in note taking so I won’t be called on. I also get to see the HD education in action in the community. Under the leadership of Superintendent Major General Jerry Grizzle, NMMI has emphasized its connection to the city of Roswell. A member of the staff is involved in every civic club in town, and many student events and facility spaces are open to the public. “You can’t distance yourself from the community,” Grizzle tells me. “We’re too much of an integral part.” Which explains the line of kids in a hallway of Del Norte Elementary School one evening, all waiting for their turn to be engulfed by a giant bubble. It’s Science Night, and some 50 NMMI cadets have set up experiments for the kids. I explore the classrooms, where desks and blackboards have become backdrops to static energy balls and magnets—more than 30 experiments in all. And meanwhile, in the hallway, the line of young scientists eager to explore the physics of bubble formation grows longer, each kid giggling as cadets lift a giant detergent bubble ring around them. “It’s the best night of the year,” Principal Andrea Edmonson tells me. There’s a stillness in the air. And a sense that the stillness has been earned: a quiet reward for a hard day’s work. At 18:00, the bugle plays retreat, and every cadet pauses while the two flags on post are lowered. Afterwards, in their rooms, cadets prepare for the inspection that will take place the next morning, when Squadron Sergeant Major Jose Salido and others will ensure their rooms are “to standard.” Jose will run a finger over the top of the door, looking for dust, point out a pillow that’s facing the wrong direction, ensure that the books in the bookcase and the bottles in the medicine cabinet are lined up tallest to shortest, and—if all is in order—pronounce it “good” and move to the next room. Around 21:50, the sun having set and the campus swaddled in darkness, Cadet Julian Brown, 21, enters the Hagerman guard box with his trumpet. At 21:55, he lifts the receiver on the phone next to the desk, dials 00 to initiate a post-wide announcement, then trumpets the call to quarters into the receiver, the sound echoing through loudspeakers all across the post. All cadets must be in their rooms. Five minutes later, at 22:00 exactly, Julian turns out the light in a show of respect, places the phone on the desk once again, and brings the day to a close with the mournful sound of taps. Lights go out in the barracks, and the post is quiet. AS I WALK TO THE PARADE GROUND for the Saturday morning parade, I know it would be faster for me to cut across the grass. I can’t bring myself to do it. Family members and friends take seats on the bleachers. The band begins to play, and the cadets march out, while everyone in the bleachers lifts a camera simultaneously. As the troops march past the reviewing stand—“Eyes … right!”—the show of precision and order is rousing. After the parade, cadets assemble in the Hagerman box as family members look on. Today is a special day, not only because families are here, but also because it’s the day when cadets who have completed their time as RATs will turn and become New Cadets. A roll call of their names is read over the loudspeaker, then Lieutenant Colonel Graff congratulates the cadets. They respond with a deep-barreled “Hooah!” The formation ends, and cadets mingle with their families as they laugh and yell to one another. Most do, anyway. A few are doing push-ups to work off a morning demerit. As I cross Bronco Plaza one last time, the wind lashes the Centennial Flame into a frenzied dance. A sole cadet in dress uniform is on Flame Guard duty. Behind her, the box echoes with laughter, but she stands stoically, her shoulders squared, one hand at her side, the other holding her rifle, eyes focused unwaveringly straight ahead. Then she turns, shifts her rifle to her other shoulder, and marches across the mat to a position on the other side. She’ll repeat this, back and forth, like clockwork. So fluid, so precise, so singular in intent, every movement, every bend of her arm, every turn of her head executed as if it were part of a ritual that began when the very first spark ignited the very first flame and will continue for eternity. The effect is everything it should be: awe-inspiring, poignant, haunting, comforting. This cadet—to whom the most important responsibility on post has been entrusted—she is all cadets. She, like her companions, can rappel down a 60-foot wall, quote Shakespeare, march 26 miles in the desert heat, command a squadron of her peers, and laugh with friends who become her family away from home. And when the occasion calls for it, she can summon the commitment to stand in solidarity with tradition, duty-bound, offering her personal sacrifice in the pursuit of the greater good. She is the embodiment of a spirit 125 years in the making. —Contributor David Pike writes about small-town New Mexico. He is the author of Roadside New Mexico: A Guide to Historic Markers (UNM Press).